Altair Barlows are much higher quality than cheap packaged Barlows where manufacturers are usually forced to squeeze in as many accessories as possible under a particular price point. This Barlow lens is a highly recommended accessory for webcam imaging of planets with an IR-Blocking filter (also known as an IR-Cut filter), or for visual obsering of the planets with your 1.25" and 2" eyepieces. If you have a small portable refractor with a short focal length, this is the ideal accessory for lunar and planetary viewing and it's pretty much a standard item in most telescope packages. Barlow lenses are designed to increase the magnification of your existing telescope eyepieces when you place the Barlow between the eyepiece and telescope. This can effectively "double" the size of your eyepiece collection by adding a single accessory. For example a 20mm eyepiece becomes a 10mm one with the Barlow, and a 15mm eyepiece becomes a 7.5mm one. If you have both a 20mm and a 15mm eyepiece, you've effectively doubled your eyepiece collection already! The Altair-EX ED Barlow has a 2" barrel which is threaded for 2" standard astronomy filters, and it has an internal blackened thread to stop stray light reflection to increase image contrast. ED optics bring the coloured wavelengths of light to a common focus which gives better performance than non-ED optics, and this also improves image contrast. All optics are multi-coated, and as you can see from the photograph, reflections are almost invisible on the glass surface (we used a flash too). 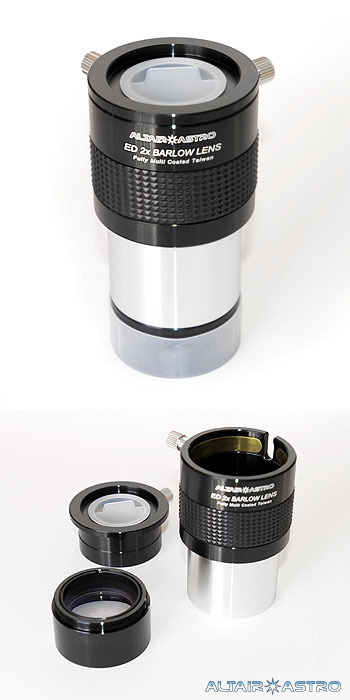 The lower lens cell portion of the Barlow can be removed and threaded into a variety of M48 filter thread adapters. A precision machined "low profile" 1.25 to 2" eyepiece adapter with brass compression ring is also included, which will not mar your eyepiece barrels. The Altair-EX ED Barlow comes with a durable hard presentation box with a protective foam insert, and two plastic end caps.